It’s a shame that cereal can be such an amazing comfort food because so many varieties on the market today do absolutely nothing for us nutritionally. In fact, a lot of them just pump us full of sugar and leave us crashing about an hour after eating probably three times the serving size we planned. Whoops. However, there are healthy cereals that taste good — you just have to search a little harder (and read a lot of labels to find them). So, we did a lot of the grunt work for you and found 11 cereal options that will please your taste buds, as well as your nutritionist. 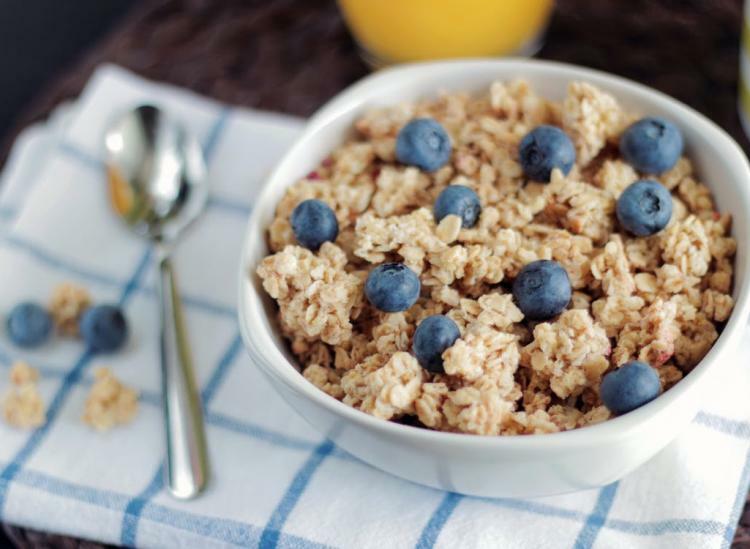 Our goal was to only include cereals that have fewer than 250 calories and 8 grams of sugar per serving, and at least 3 grams of fiber and 5 grams of protein to keep you full until lunchtime rolls around. And we got pretty close. So, this is definitely one of the more “earthy” cereals on the list, but it manages to steer clear of the land of cardboard so we’re cool with it. It aces every nutritional category in terms of our criteria while boasting a little extra protein and fiber, and its list of ingredients is even eager to please. Everything is organic, pronounceable and good for you. Go ahead — toss a few blueberries in this bowl and get your breakfast on. Granolas are tricky because a calorically-dense serving typically fits in the palm of your hand, but Bear Naked is certainly worth including on this list. The honey almond variety hits every bit of nutritional requirements on our list — including a quality ingredients label — while also providing the perfect flavor pairing for a cup of yogurt and some fresh berries. Powerhouse breakfast parfait, here we come. Finally, a crunchy blend of flakes, nuts and granola clusters that provides a subtle, sweet flavor without loading up on all the sugar. The crunch pecan variety of Great Grains cereal also hits the protein mark and exceeds our fiber requirements. The calories are a little high, but the serving size is nothing to scoff at. Holy staying power, Kashi. How do you pack so much protein and fiber into one 3/4-cup serving of cereal? We’re guessing it has something to do with that laundry list of ingredients “enriching” the grain blend. While we don’t love this complicated detail, we do appreciate that the cereal only misses the sugar mark by one gram and aces the rest of our nutritional categories. All hail Barbara’s Puffins cereal! Honestly, all flavors of this one are delicious, but we decided to go with cinnamon because it ups the protein and fiber content a little bit. The protein is still a little lacking, but the super reasonable calorie content means you can pour yourself an extra big bowl to make up for it. Sounds like a pretty sweet deal to us. Quaker comes in clutch on this list with these sweet, crunchy biscuits that become perfectly soft when milk is added to the equation. Their oaty foundation makes them a hearty, filling choice, and the protein and fiber content certainly pull their weight, too. There might be one too many grams of sugar, and the ingredient list is a tad long and chemical-based for “enrichment,” but hey, we all have our flaws, right? Leave it to Fiber One to bring all the dietary fiber to the table. Sure, we compromise a little on the protein with this one, but the staying power of 10 grams of fiber surely makes up for it. And it also means that those two additional grams of sugar over our ideal amount won’t necessarily lead to unpleasant spikes and crashes. So pour yourself a cup and enjoy that honey flavor. It doesn’t get much better than Kashi, guys. This healthified version of Honey Nut Cheerios brings all the crunch and sweet honey flavor with wholesome ingredients and very little sugar. It is a little low in the protein department, but since it’s only 120 calories per serving, you could make it a double and get all that you need from your breakfast without going overboard. Amen to guilt-free seconds. Special K got a facelift and with improved nutritional information to match. This new blend of fruits, nuts and grains does a solid job of giving you the protein and fiber you need in a hearty cup-size serving. It exceeds our ideal sugar content by two grams, but its sibling cereals are far more offensive. So consider this one your new go-to if Red Berries was always your jam. This cereal literally gives us life. It pairs just the right amount of sweetness with a unique, unforgettable and certainly crave-worthy texture. And while the protein and fiber are a little underwhelming, a double serving of this breakfast staple will certainly get you to where you need to go without exceeding that 250-calorie mark. Quaker, you just get us so well. This childhood classic is one of the very few your parents allowed you to have that actually keeps the sugar in check. It also has just six ingredients, and we can pronounce and visualize five of them, so not too shabby. It’s a little low on the protein side, but it has just the right amount of dietary fiber. Don’t expect this one to keep you full for hours, but don’t feel guilty about reliving a favorite childhood memory with it, either.